Advantages: A detailed examination of Russia’s swing-wing strike aircraft. The Aerofax series from Midland Publishing have long been producing volumes useful to the modeller and technical enthusiast, covering aircraft types from around the world, including the Eurofighter and more recently the F-22. 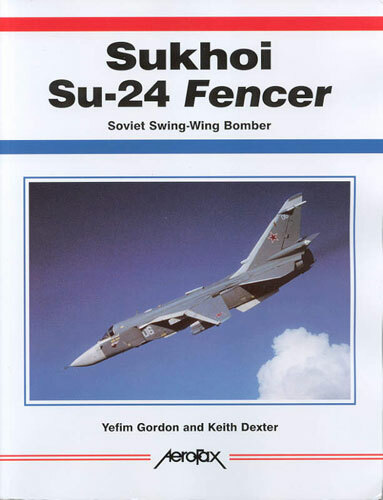 This volume sees regular Midland author Yefim Gordon produce a definitive history of the Su-24 Fencer strike aircraft. Emerging from a Soviet requirement for a long-range attack bomber to address the short-comings of the Yak-28 and Su-7 families (notably range) the Fencer was developed in the 1960’s and finally entered service in 1973. Gordon as always starts from the very beginning of the Fencer story and it is fascinating to see the evolution of the Su-24 from the TSR2-like T-6 to a final production design reminiscent of the F-111. What finally emerged in the 1970s was an aircraft not altogether different from the Panavia Tornado in capability. More interesting still is to see that it is still the most numerous bomber still in Russian service (over 500), a figure which attests to both its fundamental success as a design and the slow progress in the development of a replacement (such as the Su-27IB Flanker derivative) due to the economic limitations placed on the post-Soviet Russian Air Force. One thing I like about a book written by Gordon is the reader knows exactly where all the information on a particular aspect is located. This volume is no different, with the opening chapters covering design and development, the second covering the many variants produced and the third covering the aircraft in detail, including close up photos desired by a modeller. The final two chapters cover the service history of the type as well as a look at Fencer operators. For such a potent strategic aircraft the type was exported to a number of countries, many of which are no surprise like Algeria, Iraq, Libya and Iran. Rounding out the book are scale drawings and a nice array of colour profiles spread over six pages which will provide some nice modelling inspiration. Whilst I can think of only the Dragon 1/72 kit of the Fencer, it was a relatively nice kit typical of Dragon in the late 1980’s. More importantly it was released in all the major sub-types allowing a range of options to build. If taking on the challenge of this model, then this Aerofax volume will serve as an excellent reference.